I hope everyone is enjoying the changing of the weather from fall to winter and getting ready for the upcoming holidays! In September, the 2015 District 12 Conference was held in Beautiful Boulder, CO! Our theme this year was "HERstory of Heroes." It was a great event! See my article later in the newsletter for the highlights of the weekend! 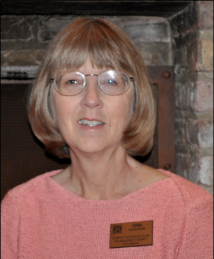 Thank you to Debbie Willis, Zonta Club of Billings, for accepting the Archivist/Historian role. 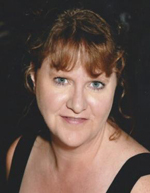 She replaces Beth Robertson, Zonta Club of Laramie, who will be moving out of state. 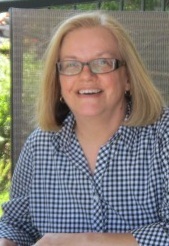 I thank Beth for all her work and contribution during the biennium! District 12 has ANOTHER International Scholarship winner! Edit Maszlaver, nominated by the Zonta Club of Denver and selected as the D12 Jane M. Klausman Scholarship winner, was selected as one of 12 International winners! Leadership Training is being offered again in November and December. Although specifically targeted for Presidents/Vice Presidents, Treasurers, Secretaries and Club Boards - anyone can attend. Please see your email notices for date/time and call in number. Zonta International Public Relations Committee provided an update on the new Zonta International website and print portal. Improved navigation - better search functions, designed from Zontian's input. "My Zonta" - a personal web experience with Zonta - just for Zonta members that will include your Zonta profile and member information; quick links to materials needed for your job as an officer in Zonta, and links to your preferred areas in the Zonta Community. Zonta Community - a private social network for Zontians to share, talk and connect. Zonta Foundation - a dedicated section for materials and tools of the Zonta International Foundation. Zonta Print Portal - remember the question during the Area meetings on interest in to an online tool that will allow you to use branded Zonta materials to that you can tailor to your club's logo and contact information? IT IS COMING in December! It will contain a library of tools over time by "crowdsourcing" from Districts and Clubs. 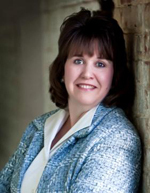 Presidents - don't forget to invite your Zonta leaders (Governor, Lt. Governor, Area Directors) to your meetings/board meetings or special events. One goal for Governors is to visit all clubs throughout the biennium. I'm on my way to visit Black Hills and Pierre, SD areas from December 4-6, 2015. I'm excited to celebrate Pierre, SD club's 60th anniversary. We will start with a photo in front of the Holiday Tree in the State Capitol building followed by a reception and a dinner. The main tree in the Capitol building was decorated by the Zonta Club of Pierre-Fort Pierre. Please focus on the upcoming programs before the end of 2015. Zonta International's Service Recognition Awards Program - Clubs and Districts have the opportunity to get visibility and publicity for service projects at the 2016 Convention in Torino. Both club and district awards will be given out at that time. District 12 will be submitting a district project for an international award. It is the District "Silent Witness" Project. The project was kicked off during District Conference and asks Clubs in District to participate in the program by creating (or borrowing already created) "silent witness" silhouettes, displaying the silhouettes in a public area, and providing presentation (powerpoint presentation template provided) to organizations educating on domestic violence. 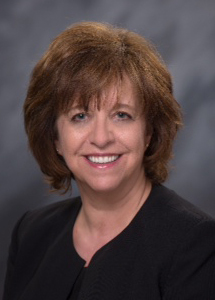 See article by Ann Hefenieder in the Outreach. All clubs have received the silhouette templates, instructions and slide show template. They are also available on the District 12 website. Take pictures, get publicity and send in report form to Ann Hefenieder at ahefenieder@mt.gov by December 29, 2015. District 12 will be submitting the 3 best club projects for an international award (one must be from the category of violence against women and girls). 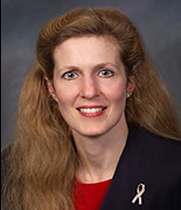 Each club may submit 2 projects - one in each category - for consideration to Ann Hefenieder at ahefenieder@mt.gov by December 29, 2015. A nomination form, picture and description are needed. See details at http://www.zonta.org/ClubsLeadership/Tools/ServiceTools.aspx. Edit Maszlaver, the Distirct 12 Jane M Klausman Scholarship winner, has won one of 12 International JMK $7000 Scholarships, it was announced recently. 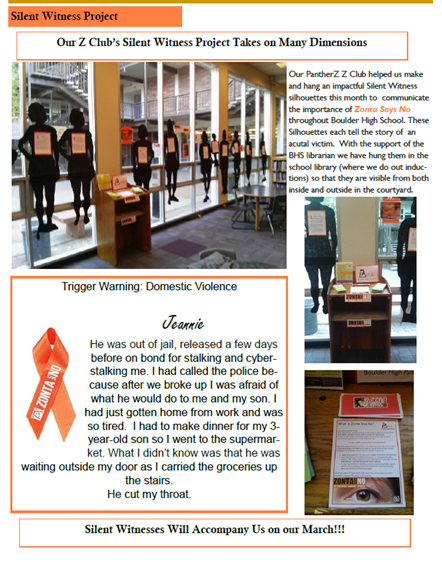 Edit's story was featured in the last Outreach. When contacted, Edit's response was "I am overjoyed to receive this scholarship and honor." Edit recently attended the District 12 District Conference in Boulder, and graciously accepted the D12 Scholarship of $1000 ($500 from District and $1000 from International). 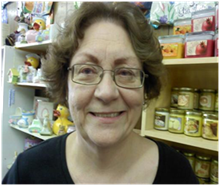 In addition, she received $1500 from the Zonta Club of Denver, her sponsoring club. 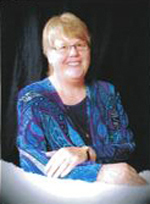 Edit also was a recipient in 2011 of the Zonta Club of Denver endowed scholarship for single mothers. A report form has also been posted on the website. The form captures the necessary information needed for the District submission. The completed form, and one digital photo, should be e-mailed to Governor Marcy (Marcy.O'Toole@Level3.com) and Ann Hefenieder (ann.hefenieder@gmail.com) by 5 p.m. on December 29, 2015. Several clubs have shared photos and details of their project on Facebook. The Zonta Club of Greeley displayed the silhouettes at a local community college and participated in a panel discussion. The photo is from an earlier display at the Centennial Library. In mid-October, District 12 sponsored a visit by Leslie Wright, UN Committee Chair for Zonta International. Along with local UNA Chapters, the Denver, Foothills, and Ft. Collins Zonta Clubs hosted four presentations & discussions at which Leslie shared breaking news regarding the just-approved 2030 Sustainable Development Agenda. These events also included a look at Zonta's participation in working with the Women's Major Group to negotiate the content of these Global Goals. 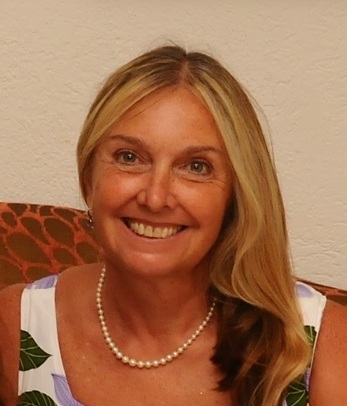 Not only did Leslie inspire our own members, she also informed non-members of Zonta's integral role in international advocacy at the United Nations. Leslie is top-center, holding Goal # 5 (equality for women). These goals & targets will have relevance for Zonta goal-setting & programs --as well as other NGOs, governments, and foundations-- for the next 15 years, so becoming informed regarding their content & measurement is recommended. We have an audio transcript, but are awaiting an edited Youtube video. For reference, see http://www.zonta.org/ClubsLeadership/Tools/SustainableDevelopmentGoals.aspx . If you have any questions, please don't hesitate to contact Kay. 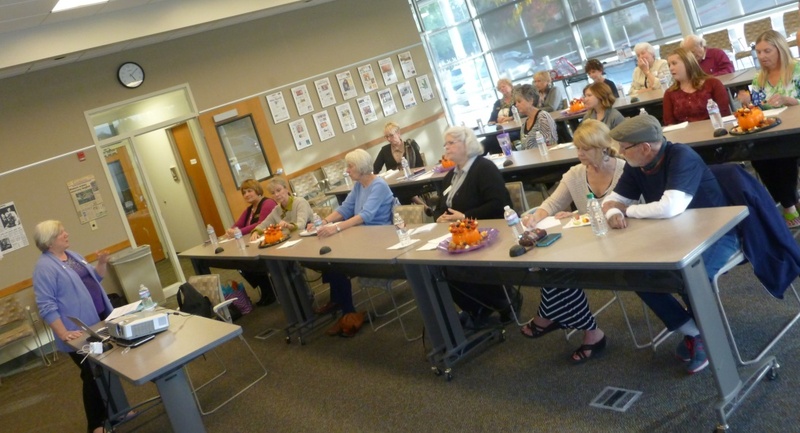 10-16-15 Ft. Collins: Leslie Wright & participants at beginning of the presentation; 50 seats were filled by the end. 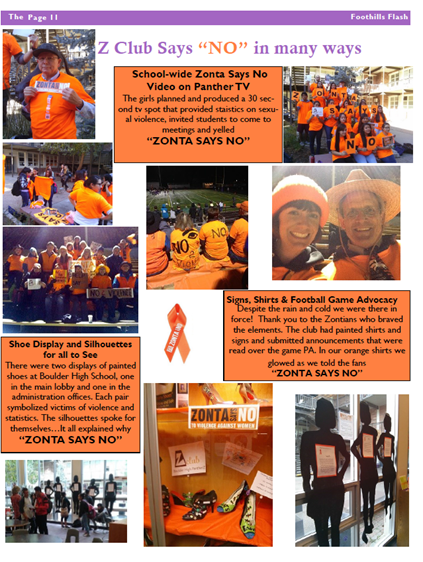 During November our Clubs are currently busy with "Zonta Says NO" activities. Please share pictures from your events & outreach with us. Our committee will be having a conference call November 3rd @ 7 PM. We are developing new content for the Advocacy portion of the D12 website and planning our communications to get you the latest regarding relevant legislative proposals in your State. The dynamic clubs in Area 1 are engaged with creative fundraising events and new member recruitment. Members are actively involved in advocacy cultivating strong partnerships with local violence prevention and intervention programs. Pierre/Fort Pierre members are creating decorations with a message to adorn an amazing evergreen as the centerpiece tree at the South Dakota Capitol building. On December 5th, all Zontians are invited to gather for a photo at the Capitol to be followed by a reception and dinner that evening. This highly visible event will generate a great deal of awareness about the work of Zontians locally and globally. The club is also celebrating a milestone 60th Anniversary this year. The Zonta Club of Spearfish will host their must-see Festival of Trees from December 2-5, 2015. There is something for everyone including an opportunity to give generously to support the needs of women and children. On November 14th, the Zonta Club of the Southern Black Hills will host an educational program on learning to make changes and stay safe. The program entitled, "Empowering Women and Girls for Violence Prevention" is open to the public. Zontians in Billings and Sturgis supported their local domestic and sexual violence shelter programs through participation in candlelight vigils. The Zonta Club of Sturgis held a special membership drive meeting with special guests Andrea Hovey, Area 1 Vice Director and Tammie Brock, Crisis Intervention Shelter Service Director. The Silent Witnesses were displayed and members were educated about their stories and purpose. The Zonta Club of the Black Hills remains committed to providing the community with empowerment, advocacy, and fellowship at their Zonta Expo. The Glendive Club hosted an Arts and Crafts Fair from November 13-14, 2015. Be sure to like and follow their club Facebook pages. You'll be amazed by the efforts of these smart and committed women. Area 2 Meeting - "Making a Difference - We can! We will! We Are!" Hello from Charlotte, North Carolina. While I am enjoying the warm weather here in the Queen City, it would be impossible not to miss the great clubs in Area 2 and all of the wonderful work they are doing right now. I am so very proud, even though I am so far away. Here are a few of the brief highlights, even though they always do so much more and are all so very committed and courageous. The Cheyenne Club is actively working on their Second Annual Art Content. This event is raising awareness on domestic violence and human trafficking through art. They are also already hard at work in planning Zonta's Ladies Night Out. Keep up the excellent work. The Greeley Club held their Holiday Flair Around the World in October that included a Fashion Show, Luncheon and Silent Auction. While the club is still fairly new, they already have silent Witness displays that tell the stories of victims of domestic violence. The display was at the Centennial Library for the month of June. 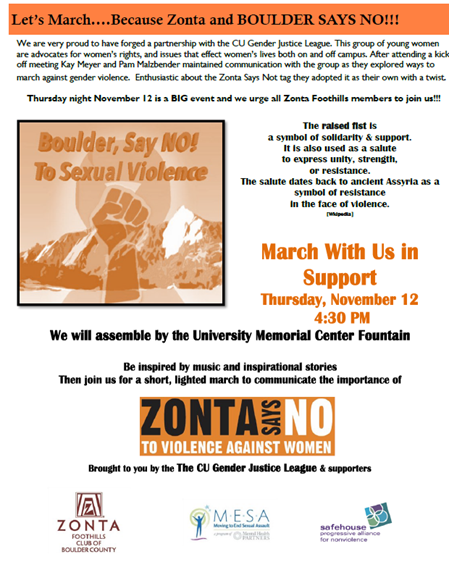 This project is part of the Zonta Says No! to violence against women campaign. You are a small club, but you are MIGHTY! Just in time for Halloween, the Laramie Club held their Masquerade Ball. The event included live music, dancing, raffle prizes, and a costume contest. The pictures and costumes were amazing. They were also highlighted in the Laramie paper. A great time was held by all. Congratulations. The Converse County club participated in the Main Street Douglas Jackalope Square Farmers' Market this am with Homemade Hummus, Blueberry Scones and delicious Cookie Bars. They also held their Social in July. You are very visible in the community! Great job! And finally, a big shout out to the Zonta Club of Fort Collins. Not only did they charter a new Z Club in October, but August 20th, 2015, they completed their 1000th birthing kit. Imagine for a moment the impact that this has had on the women who have received them. Excellent work! Your efforts are not unnoticed or unappreciated. You are making a difference! Don't forget to SAVE THE DATE for the Area Meeting. Our meeting will be hosted by the Fort Collins Club on April 15th and 16th, 2016. More information will be forthcoming, but mark your calendars now! Stay warm and safe! And keep on moving forward! YOU GOT THIS. 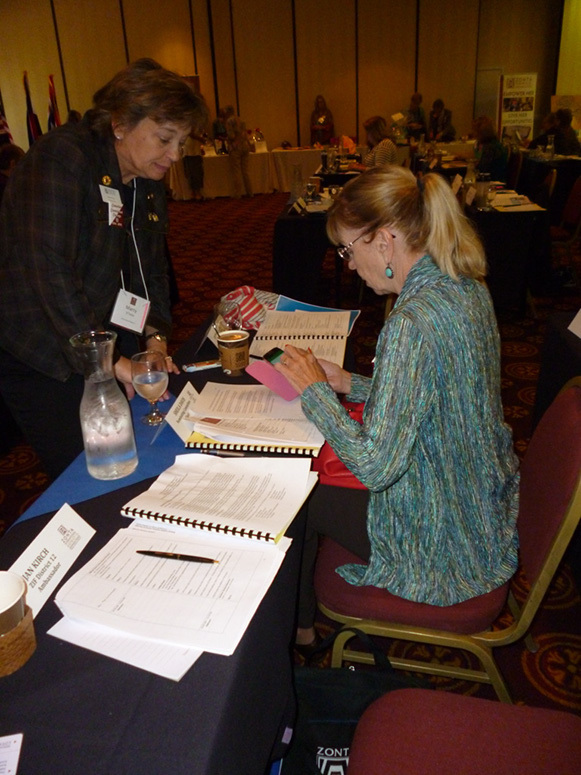 The 2015 District 12 Conference was held in Boulder, Colorado in September. It was hosted by two Area 3 clubs, Boulder Foothills and Boulder County. The Conference Committee, chaired by Michelle Medal and Colleen Yuskewich, worked with Governor, Marcy O'Toole to plan a full, exciting agenda with time for learning, socializing and fun. All Area 3 clubs contributed to the Conference's success. Douglas County put on a Trivia contest at the Friday night social. Denver II judged the costume contest Friday night and awarded prizes. Lakewood/Golden provided the D12 Scholarship raffle basket. Denver assisted Lt. Governor, Renee Coppock, with the Sunday morning memorial service. 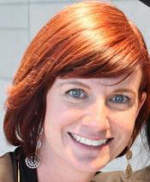 Area 3 is again combining the Area meeting and the Amelia Earhart Fellowship lunch. The event will be held January 23, 2015. The current AE Fellow attending CU Boulder, Clemence Bacquet, will attend. 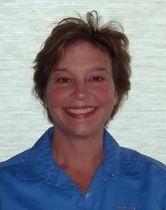 Sharon Langenbeck, District 12 liaison and past AE Fellow will speak. Douglas County is hosting. Rhonda Bolich-Lampo and Douglas County President Judy Nesavich are working with me and Deb Ureel, D12 AE Chair, to plan the event. Zonta International UN Committee Chair Leslie Wright was invited by Kay Meyer, D12 Advocacy Chair, to visit the area and participate in several events. Denver and the Denver UNA hosted her speech at the World Trade Center in Denver on October 14. 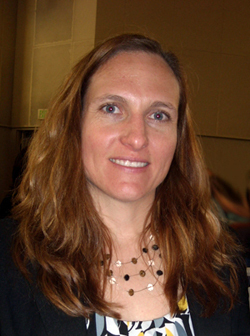 Foothills hosted a speech and reception for her with Boulder UNA on October 15. 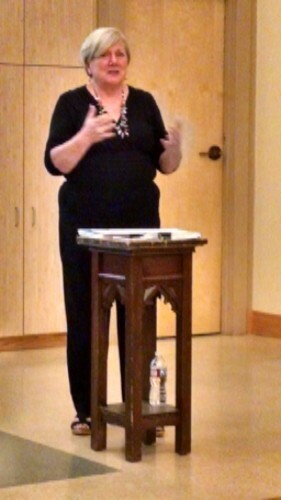 Leslie spoke on the Global (Sustainable) Development Goals. Hello to all from Area 4. we maybe the smallest but that does not mean we are not busy. So much is going on in our Area. Our area meeting is being hosted by Pikes Peak and we have started working on it. The meeting will be April 8 and 9, so please save the date. We hope to have a good representation from all clubs. Royal Gorge just finished their first successful Zonta Zing Women's Expo. 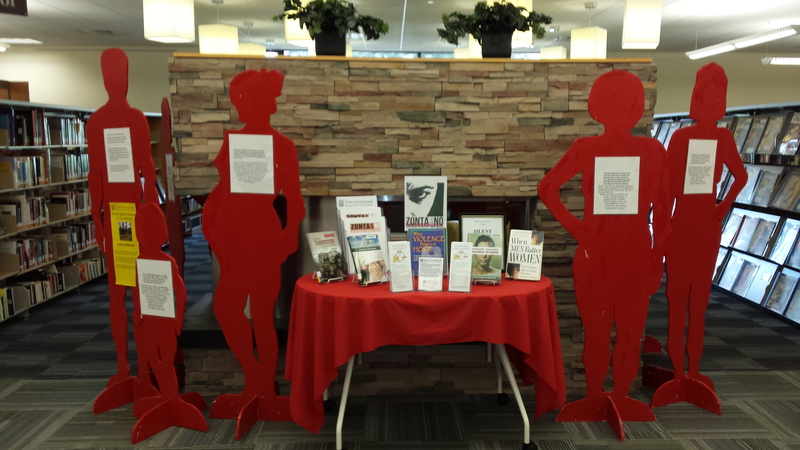 They presented the Silent Witness silhouettes at the event and had several women state that they are interested in learning about Zonta. The expo replaced their Women's Art Show they had done for many years. They will be having another new member night soon. Pikes Peak has been working on membership, they are at 23 members, which is 1 above their goal of 22 for June of 2016. The Nov. 5th meeting included a self defense program, which Lois Schroeder and I attended. Prowers County is working on their Holiday Home Tours, Girls Wanna Have Fun Night, and of course the 16 days of activism. Their membership is at 35, 7 above their goal of 29 for June 2016 and they will be having more new members submitted as Braunwyn Nidey hosted another membership night Nov. 5. I am so proud of all the clubs and members in my area. The very best part of my job is making new friends and learning about the club activities. It was awesome seeing everyone at the District Conference. Need some new ideas, or just want to talk about your office? Better yet -- do you have a best practice to share? The District 12 Leadership Team is offering club training on the dates provided below to any and all District 12 Zontians. You don't need to be an officer to participate! Join the conversation and learn from others in your District as well as from District leaders who have held these club positions. Club President and Club Vice President Training will be offered by Area 4 Director Linda Hawkins on Tuesday, December 1, and Wednesday, December 9 from 6 - 7 PM. To participate call into the following toll free number then add the meeting ID when prompted. Call in number: 1.800.747.1915. Meeting ID: 6309216#. 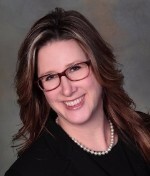 Club Board Member Training will be offered by Area 1 Director Teresa Forbes on Thursday, December 3 and Thursday, December 10 from 6 - 7 PM from 6 - 7 PM. To participate call into the following toll free number then add the meeting ID when prompted. Call in number: 1.800.747.1915. Meeting ID: 6309216#. 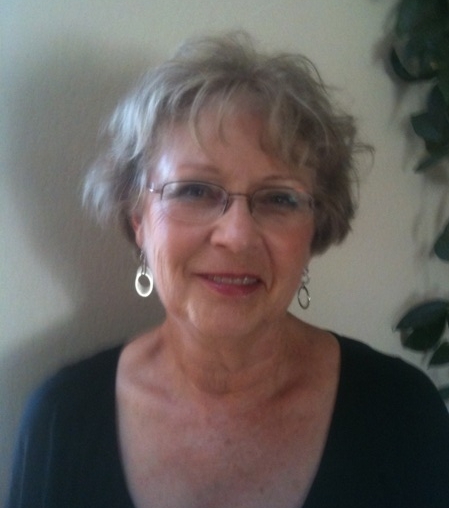 Club Treasurer Training was offered by District 12 Treasurer Terri Otley on Tuesday, November 10 and Thursday, November 12 from 6 - 7 PM. 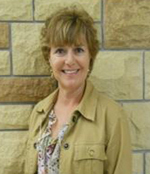 Club Secretary Training will be offered by District 12 Secretary Deedee Boysen was offered on Tuesday, November 24 and will be offered on Tuesday, December 8 from 6 - 7 PM. To participate call into the following toll free number then add the meeting ID when prompted. Call in number: 1.800.747.1915. Meeting ID: 6309216#. We look forward to hearing your concerns and to sharing our ideas with you! A special thanks to the young panelists who helped us during the membership session at the District Conference in Boulder. We all learned that younger members are not as different from the "more experienced members" as we may think. Younger members want to focus on the Zonta mission. Accordingly, to make clubs attractive to new members and to retain those members, clubs need to make Zonta's mission the key focus of membership and facilitate each member's knowledge of Zonta and its successes worldwide. This can be accomplished through newsletters (hard copies or electronic), websites, encouraging participation in area meetings, district conferences and the international convention. Clubs should regularly disseminate information about international awards and other types of recognition, such as length of membership awards, Zontian of the Year, and member incentive awards. The panelists were very adamant that clubs also need to focus on service and advocacy projects in line with Zonta's mission. The mission is why most women join Zonta, so keep the mission in the forefront in every activity. Engage members to analyze the root causes of issues in the community and decide how your club can address them. Engage all members so that each one feels necessary for accomplishing the goals of the club. Younger members want effective and useful meetings. If they are giving up time from work or that could have been spent with family or friends, they want to feel that the meetings have been productive. Consider posting minutes and committee reports on-line so that meeting time can be spent learning about relevant issues or listening to interesting and informative speakers. So, are the clubs in District 12 recruiting and retaining members? The chart below shows each club's progress. Eleven of the 21 clubs have met or exceeded their goals for June 1, 2015. Although slightly more than half of the clubs have met or exceeded their goals, the District only has 1 more member than this time last year-that is District-wide. Your Area Vice Directors and I need to hear from each club's membership chair to determine how we can help each club recruit and retain members. A continued decline in membership means less women working on the Zonta mission. Membership recruitment and retention is just as important as service and advocacy. Without members, there will be no service or advocacy. I will be sending out information for our next membership conference call. This is a great time to share ideas on membership with the Area Vice Directors, membership chairs and club presidents. We can learn a lot be simply sharing ideas and best practices. For those of you new to Zonta, an e-club is a Zonta club that has all the rights and responsibilities of a Zonta club, but simply holds their club meetings electronically. E-club members may meet in person as a group or independently for service projects and fundraisers dependent upon each member's proximity to one another. Zonta district involvement in the design, planning, establishment and ongoing quality assurance for an e-club is essential. Members should recognize that an e-club is a valuable asset, requiring the investment of intelligent planning and careful attention to detail. That is why we need the help of the entire District to make this work. Our E-Club is slowly taking shape. We need 15 committed members. At last count, we were up to 10. Please send me names and contact information. The Zonta Club of the Black Hills will be helping to organize final preparations for the new club. The end of the year is upon us, so we need to act soon. 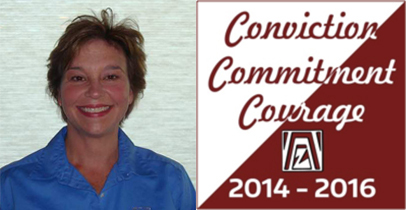 If you have questions about membership, be sure to contact me at rcoppock@crowleyfleck.com or 406-255-7287. The following images are some examples for what your club could post on social media (Facebook, Twitter, Instagram, etc.) to promote what is going on in your club. 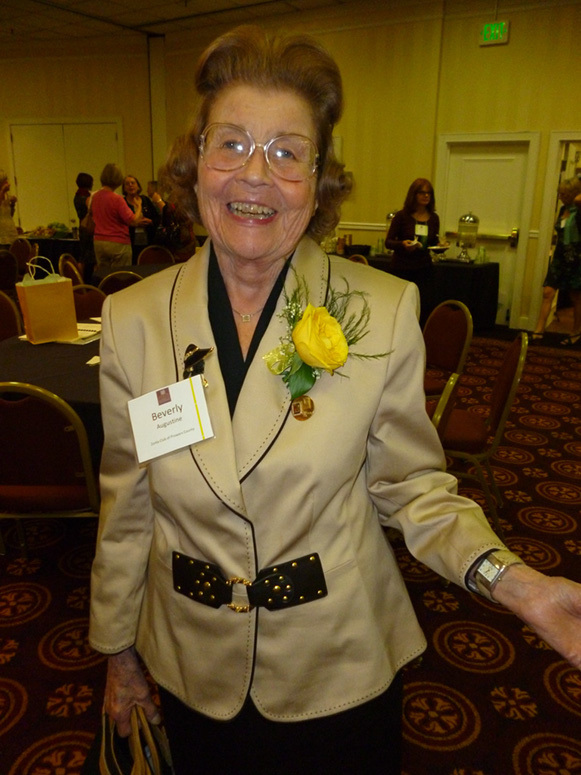 2015 District 12 Conference "HERstory of Heroes"
A successful 2015 District 12 Conference was held in Boulder September 25 to 27, 2015, hosted by the Zonta Foothills Club of Boulder County and the Zonta Club of Boulder County. The theme: "Herstory of Heroes" was chosen and the idea of women heroes was woven throughout the Conference. This included: telling the group about "your hero", honoring "Club Heroes (Zontians of Year)," celebrating our "Super Heroes (Zonta length of membership > 25 years)", remembering "our Heroes (Memorial Service)," recognizing our "Future Heroes (Z Clubs)" and becoming "Hero" to those around us. There were 112 attendees at this year's event. Eighteen clubs sent delegates and the remaining three clubs sent their votes with proxy clubs. All presentations are posted on the District 12 website at http://zontadistrict12.org/resources/2015-district-conference. Conference activities started Friday night with a welcome reception featuring a trivia contest with teams answering questions about Zonta and female heroes. Attendees were asked to dress as their favorite hero and prizes were awarded. A whole lot of Beverly Augustines! The conference was officially called to order by Conference co-chair Colleen Yuskewich and Saturday's opening Parade of Flags was headed by Boulder Brownie Scout troop 3010. They did an excellent job and were so cute. The whole group especially loved seeing the littlest Daisies following their leaders! The Business Session began with an address by District 12 ZI Liaison, Sharon Langenbeck, and a video by ZI President Maria Jose Ostergaard. Delegates approved the District budget for the coming biennium starting in June 2016. Changes to the District Policies and Procedures Manual were also approved. Our District is proposing 4 changes to the ZI Bylaws and these were approved for submission to ZI. Candidates for District leadership positions for 2016-2018 were also elected. Sharon Langenbeck spoke during lunch about the definition of a hero and how we might not realize it but we are heroes to others, like the people who benefit from our service projects and each other. "Club Board Reality Show" (presented by Teresa Forbes and Linda Hawkins) - focused on club board roles responsibilities and real “situations” were presented via case studies and discussed. Key learnings were gained by all who attended! 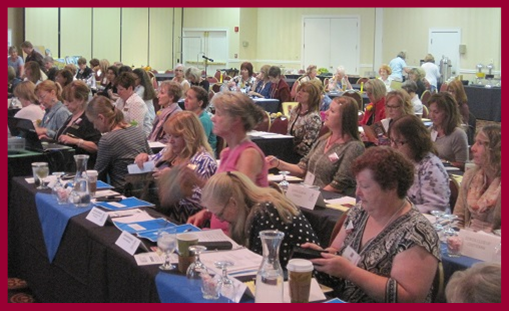 "Social Media: A Zonta Club's Voice to the World" (presented by Pam Malzbender) - focused on social media, which was a big hit! "Recruiting & Retaining Members - the Younger Generation's Perspective" (presented by Rene Coppock and Cindy Phillips (from ZI Membership Committee) - Three young members were the panel for a workshop on attracting and retaining young people. 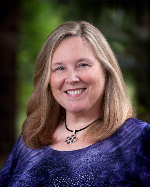 "Grant Writing Basics - Success Strategies for your Zonta Club" (presented by Patti Smith and Rachael Davis) - focused on basic grant writing - things to consider! The Awards Banquet Saturday evening was a chance to get out our cocktail attire. The evening kicked off with "A Fine Bromance," providing improvisational comedy entertainment . Rene Coppock was the emcee for the awards banquet. (club with membership under 40 that has achieved the highest net increase in membership during the past year). Banner Membership Award (club with membership over 40 that has achieved the highest net increase in membership during the past year). The District Conference heroes theme continued throughout the award ceremony by honoring our "Zonta Heroes." Edit Maszlaver, District 12 AND Zonta International winner of Jane M. Klausman scholarship (2015), spoke about how the scholarship helped her and her family. Sunday morning started with the Memorial Service, remembering “our Heroes” or Zontians who have passed away since September, 2014. Brunch kicked off with Jan Kirch, District 12 Zonta International Foundation, reviewing the Zonta International Foundation programs and the role donations (individual and club). To date, 37.6% of individuals in the district and 90.5% of the clubs have donated. To recognize our "Future Heroes (Z Clubs)," Deedee Boysen, Secretary and Z/Golden Z Coordinator and Tamara Bretting, Laramie High School Z Club Advisor discussed various details about forming a Z/Golden Z Club and described the Emma L. Conlon Service Award. Laramie High School's Z Club was the first place Emma L. Conlon Service Award winner in 2015 and took second place in 2014. 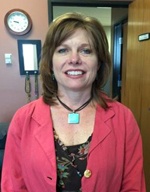 Ms. Bretting described the service projects completed by the Laramie High Z Club. In addition, the newest Z Club – Poudre High School, Fort Collins, was presented with the Z Club Charter! Congratulations!! A Welcome to the 2016 Zonta International Convention in Nice, France Video was presented, highlighting the convention location and surrounding area! 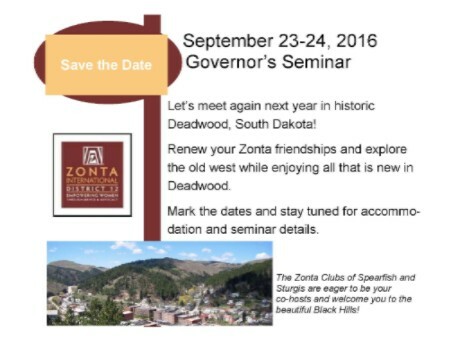 The conference was brought to a close with an invitation to the 2016 Governor's Seminar in Deadwood, South Dakota on September 23-24, 2016. The hard-working committee from Zonta Foothills and Boulder clubs. Thanks to all who attended this year's District Conference, and please plan to attend the 2017 District Conference which will be held September 22-23, 2017 in the Greeley / Fort Collins, CO area. District 12 is pleased to welcome the Poudre High School Zonta Z International Leadership Club as the District's newest addition to the Zonta International Z Club Program. Congratulations! 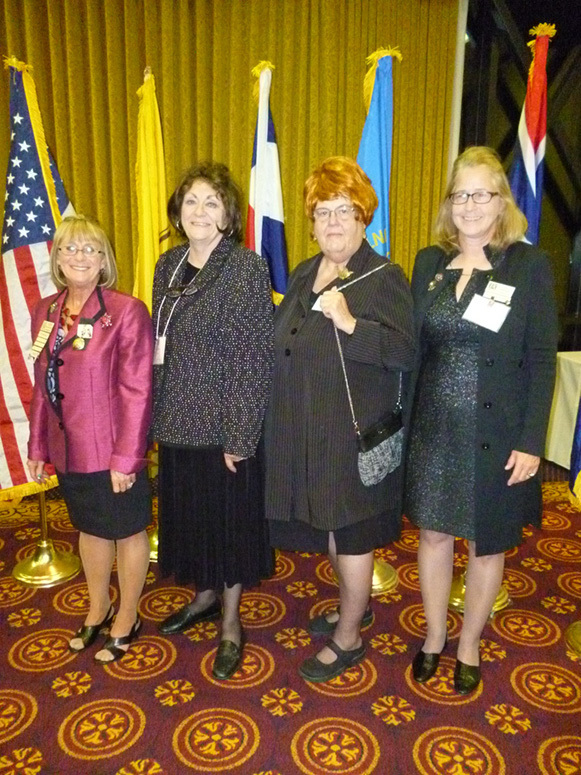 The Zonta Z International Leadership Club joins the four other recognized Z Clubs in our District that are located in Cheyenne,WY; Laramie, WY; Boulder, CO; and Glendive, MT. The Zonta Z International Leadership Club is advised by Zonta Club of Ft. Collins members Patti Smith, Judy Wray, and Carolyn Darr. The club was officially chartered in June 2015. The club celebrated its chartering with a ceremony and party held on Sunday, October 11. District 12 Governor Marcy O'Toole and District 12 Z and Golden Z Club Coordinator Deedee Boysen joined the Zonta Club of Fort Collins President Andrea O'Connell and Z Club advisors in welcoming everyone to Zonta International and the District, and inducting the new members into the Z Club. Advisor Patti Smith briefly discussed each of the officers' roles and plans for the upcoming year. The program concluded with the students speaking about why they joined the club. Throughout the year, the club will work on leadership activities and service programs. 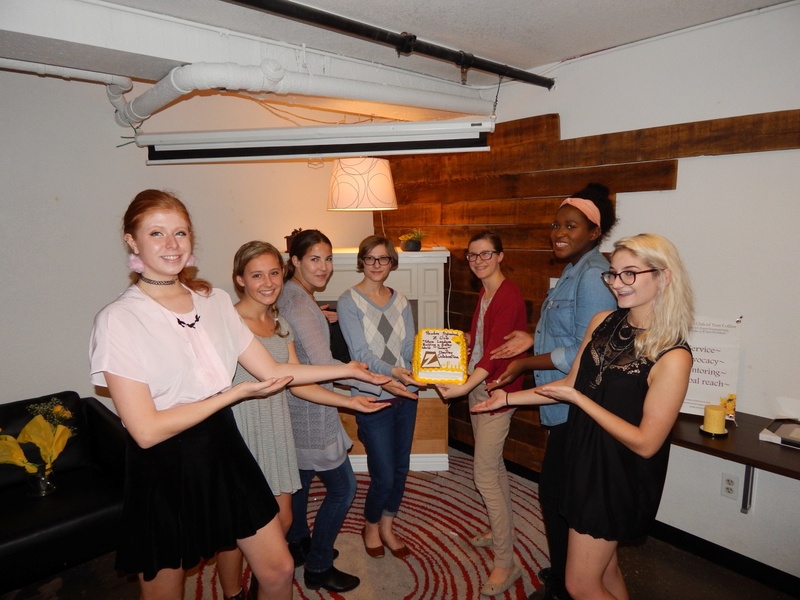 We're looking forward to following your progress Zonta Z International Leadership Club! Pictured: Poudre HS. Officers at the Chartering Ceremony. L to R - VP Lana Kinnear, Vice President; Sierra Paulsen, Secretary; Kelly Kepler, Treasurer; - Naomi Dunn, Historian/Director;-Anna Dunn, Public Relations/Director; - Javari Hunt, Member; and President Claire Neff. Congratulations to the following women for their election to next biennium's District 12 Board. 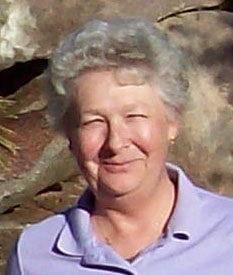 Elections were held at the 2015 District Conference in September. These women will officially take their positions after the close of the Zonta International Convention in Nice, France on July 6, 2016. There will be a District 12 Transitional Board Meeting the first weekend in June, 2016 to begin the turnover from the outgoing Board to the incoming Board. Copyright � 2015 Zonta District 12, All rights reserved.